Regardless, I would be happy to visit any time I'm in the neck of the neighborhood. Thanks for the most fantastic of times again! <3 So much fun! But awesome to have memories of karaoke now! I'm just rolling around in laughter at the comments below from feihu and azalifinrandi. We see through your devilish game, yet we are totally stuck in the trap haha. Our souls are totally all gone now ahhhhhhh...! Keep watching!!! Episode three is hilarious!!! Can't wait for more!!! Us three and you too! :D <3 Ahahaha, silly silly. I totally ROFL'd when Rei belly flopped into the pool. I wasn't quite ready for that lol. My favorite for sure is Makoto. =) He totally reminds me of Kiyoshi from KuroBasu. And the little boy hyper happy character, Nagisa, doesn't actually annoy me. How unusual! Starting on Episode 2 of Brothers Conflict now. I totally dislike the main character and Juli omg. And was loling at Suwabe's flirty monk character. I'll let you know how my favorites change when I get a better feel for them. Wait...I escaped the wrath??? Living on ramen noodles and crackers because I have no money after you update your sales page is escaping the wrath?? LOL awwww, poor you, how was the ride home Everything okay? The ride home was fine. I kept dozing off. All of the excitement made me really tired the last couple days. But I took a nap when I came home from school today and I think I got it all out of my system. Pffft you don't HAVE to stop me!! All you have to do is say "Hey I have Shiraishi things you might like." or "Got something with Hyuuga!!" or "These Gintama items are so cute!!" and now that stupid Free! is out, and you KNOW I like it, you just tell me when you have items and you've got me. I'm in too deep =_= so your leverage is not required. Lmao. LOL I see, well, I won't temp you with too many things!! Wait... you've never bought any Gintama stuff from me... KEKEKEKEKE should I start selling more Gintama goods? A nice devil...I think that fits you perfectly. The only way you'd get me away from your sales is by making me leave yourself. Lol so we're good there. wow! 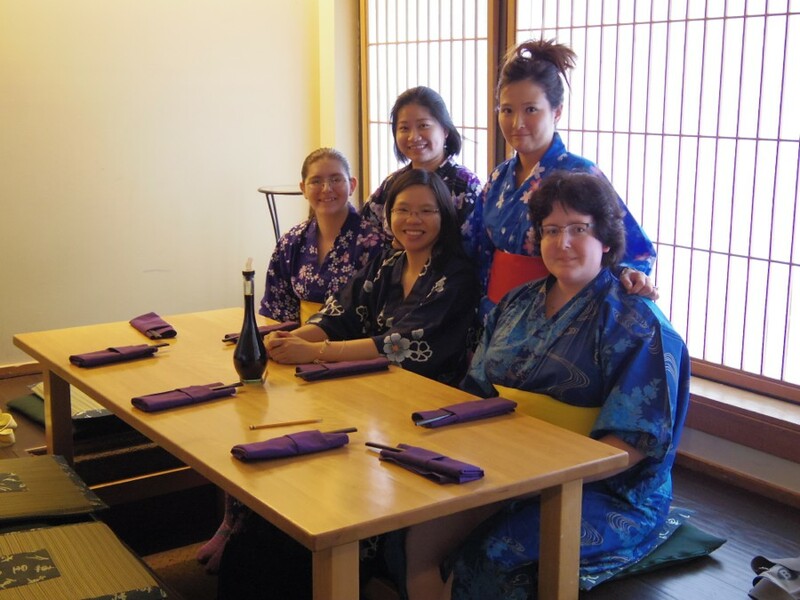 i love the yukatas. very colorful. are you the one in the center? i have a yukata as well. i won't wear it when i move next year. ah. i see. are you wearing the blue yukata with the pink sakura? ok. one more time. you are wearing the black yukata and you have the short hair? ha ha ha. should have known. it looks great on you. maybe one day, i can join the party as well. i'll even wear my yukata along with you.